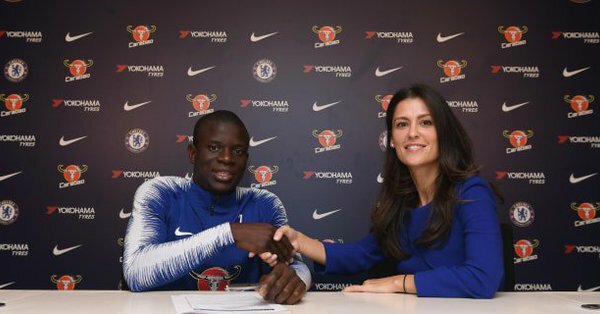 Chelsea Midfielder N’Golo Kante has pen a new record deal of 290k-a-week deal with Chelsea running until 2023, the club confirmed on Friday. The French midfielder joined the Stamford Bridge outfit from Leicester City in the summer of 2016, with his consistent match performances in front of the defence providing the perfect platform for Chelsea’s creative players as the club claimed the Premier League title in his first season under the then-manager Antonio Conte. Kante won PFA Premier League’s Player of the Year and the FWA and has maintained those high standards since for both club and country. Head to the Chelsea app to hear from the brilliant @nglkante after he signed a new contract! “We are delighted N’Golo has signed a new contract and sees his long-term future with Chelsea. When he arrived, we knew we had signed a special player but he has astounded everybody with his tireless and unselfish displays. The 27-year-old enjoyed a fine summer, starring for France as they became world champions in Russia, he made 105 appearances for the Blue’s since joining the club, scoring four times including a memorable strike in the 4-0 win over Manchester United in his debut season. And has been ever-present in the league so far this season as the club remain unbeaten under Maurizio Sarri. N’Golo Kante has made more interceptions (177) than any other player in the Premier League, while only Idrissa Gueye (310) has made more tackles than the Frenchman (262). Combative. The Frenchman high-energy displays, commitment and athleticism have won the hearts football fans and of his team-mates, with Belgian star Eden Hazard famously commenting that having him in the team was like playing with an extra man.